“It’s a broom – broom revolution,” thundered Bola Tinubu, a ruling party grandee, addressing the crowd that had gathered for Buhari’s “mega-rally”. “Broom broom!” he continued, imitating a motorbike as his fans swept the sky. Mai Gaskiya – Mr Honesty – has long been the ascetic-looking Buhari’s nickname, and his personal reputation as a lone squeaky-clean man in a sea of corrupt Nigerian politicians has survived his first term. “This is the only president no British prime minister can call a thief,” said Adams Oshiomhole, chairman of Buhari’s APC party, referring to the time David Cameron was caught on camera on the eve of anti-graft summit telling the Queen that Nigeria was “fantastically corrupt”. At the summit, Buhari was asked if his country really was as corrupt as Cameron portrayed it. “Yes,” he said simply, after a pause. But nearly three years later, rumours of corruption are again swirling around the president’s men. None of the many corruption cases initiated by the administration has ended in a conviction. A former secretary to the federation who allegedly diverted 270m naira (£578,000) of funds meant for people displaced by Boko Haram to accounts linked to him was only charged last month, two years after being indicted by the Senate. It took months of pressure from the press and parliament for him to be fired; he is currently one of the leaders of the president’s campaign in his home state of Adamawa. 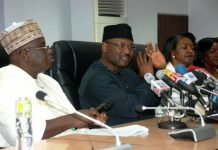 At least two ministers had petitions against them for misappropriation of funds as governors of Lagos and Rivers, the two biggest state economies. Last October, Oshiomhole, also a former state governor, was served papers by a federal high court for fraud perpetuated in office; a month later, the secret police interrogated him for collecting bribes to subvert party primaries nationwide. Transparency International said Nigeria had not moved in its latest corruption perception index released last month. Buhari did implement the Treasury Single Account initiative, making it more difficult for officials to steal money – something his predecessors had failed to do. But meanwhile, it is unclear how the $1bn (£775m) he released from the country’s Crude Excess Account to fund the fight against Boko Haram has been spent. There has also been no investigation of Abdullahi Umar Ganduje, the Kano governor who was secretly filmed stuffing wads of dollars into his robes – allegedly a large bribe in exchange for lucrative government contracts. On the contrary, Buhari has been happy to appear in public with the governor, and came in person to endorse his campaign for re-election in Kano, a traditional APC stronghold – which, with a population bigger than Belgium, is the biggest state in Nigeria. “He is a responsible man,” the president said of Ganduje, perhaps thinking wistfully of 2015. Then, Ganduje’s powerful predecessor, Rabiu Kwankwaso, delivered 1.9 of the 2.1 million votes in Kano for Buhari – something Ganduje is now expected to do, as Kwankwaso has defected to the opposition. 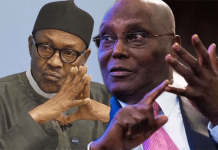 Buhari’s own enduring reputation as a “good man” of unimpeachable character is not matched by his main challenger, former vice-president Atiku Abubakar. 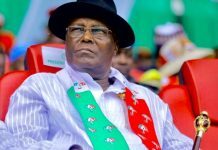 Atiku, as he is popularly known, has repeatedly denied multiple corruption allegations against him, including that he diverted $125m of public money to his own business interests and that his American wife helped him move $40m of “suspect funds” to the US, which was the subject of a Senate report in 2010. Neither allegation has come to court, but Atiku has not done much to convince Nigerians that he has changed. “I am not going to enrich members of my family but my friends. Are my friends not entitled to be enriched?” he asked a meeting of Lagos businessmen last month, only half joking. Rather, Atiku is seen as a good businessman, capable of running the economy and making good on his promises to create jobs and shrink a bloated government, outweighing the negative impact of any corruption. With vast fertile lands, enormous natural resources and a strong youth population, Nigeria has enormous potential, but successive governments have failed to diversify the economy, so it is almost entirely dependent on the sale of its crude oil. It is this money that is siphoned off by corrupt officials – for example, in the sale of an oil block possibly worth $6bn to Shell and Eni, for which hundreds of millions of dollars in bribes were allegedly paid. The companies deny any illegality and the court case is ongoing. There is nothing inherently corrupt about Nigeria or Nigerians. Most express their exhaustion at the constant theft of their resources. The country was an invention of the British empire, which decided to create a state out of hundreds of ethnic groups to make administration easier. Partly as a result, national unity is in short supply, and the country’s bureaucracy has had a tendency towards self-enrichment. Today, Britain is a key destination for corrupt officials’ ill-gotten gains – in 2016 Buhari’s anti-corruption chief said $37bn of stolen money had been routed through London in two years. But the thousands of brooms – including a giant statue of one that was put up at Abuja’s city gates on Saturday – have yet to put a dent in the dust of Nigeria’s corruption, despite the best efforts of the ruling party’s propagandists. 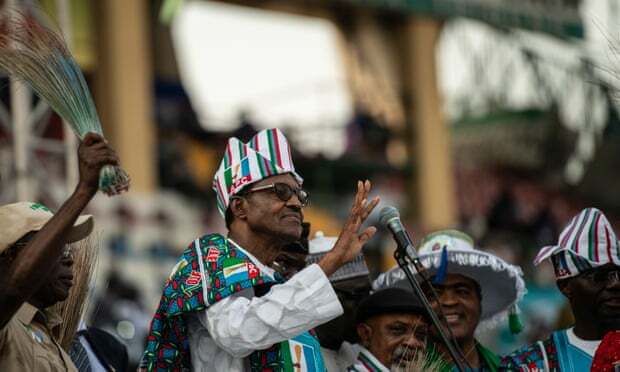 “President Buhari has made every part of this country safe again and he has stopped corruption dead in its tracks,” proclaimed a radio advert on Lagos’s airwaves ahead of the rally. “Share facts, not rumours,” said an advert sent via WhatsApp immediately after.